When I turned up for a life session yesterday I was told the model had cried off. Instead, one of the painters, Doreen, had volunteered to sit in their place. I must admit to being disappointed as I had brought paints and was going to play around incorporating some collage. However with the lighting and the way Doreen posed made it a very good study – it turned out ok in the end. I decided to move over to doing some life studies in acrylics. The pose was quite stiff, but by getting a low viewpoint something a little more interesting was achieved. A little more extensive use of charcoal with the pastel though still not getting the grittiness or directness I am after. In the one above I used even more charcoal, though probably too much and not to its greatest effect. And finally a portrait of the child of a child of the sixties, but with the lighting so poor in the studio the features are flattened by the glaring light. Another of life’s little challenges, I expect some of you have shared. 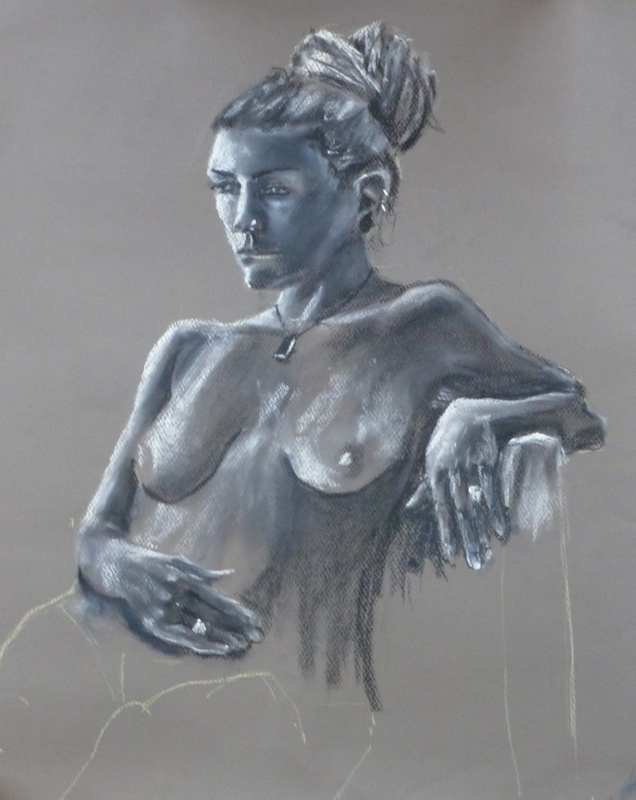 I did a tonal pastel painting on a warm grey support paper of a model at the life painting group. I was pleased with how the simple approach came out. I think the warm colour of the paper added an additional hue and gave the painting a lift.